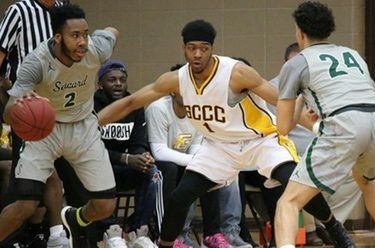 The Seward County Saints search for answers continued Saturday afternoon in the Perryman Center in Garden City as the Saints allowed Garden City to shoot North of 50% in a 90-81 loss to drop them to 3-10 in Jayhawk Conference play as the first round of league action wrapped up Saturday. Playing with another starting lineup Saturday because of a bug that made its rounds through the team late in the week, the Saints were competitive with the Busters early, taking a lead six minutes into things. Garden answered with a run of their own, holding a 23-17 advantage into the first half media timeout. Seward starting letting things get away from them as they struggled to keep Garden off the boards through the middle portions of the set as the Busters blew the game wide open, taking a 43-23 lead with 4:30 remaining in the half. The Saints finally counterpunched, cutting the Garden by nine before the break, but it remained a 52-41 Buster lead after 20 minutes of action. Both teams shot 50% in the first half, but a 10-1 advantage for Garden City on the offensive glass helped the Busters attempt 18 more first half field goals than Seward did. Kevin Sims led Seward with 17 first half points while Charles Beauregard used a hot start to pitch in 10 in the period. Seward carried their late first half momentum right over into the second, slowly working their way back into the game, cutting the Garden lead to single digits at 55-47 in the opening minutes of the period. For a stretch, the referees took the game over, blowing the whistle on seemingly every trip down the court with neither team able to find any rhythm on the offensive end of the court. By the second half media timeout both teams were in the double bonus with it still an eight point game at 74-66. Seward continued pushing, taking advantage of their chances at the line to cut even further into the Garden City, making it just a four point game, 82-78 with three minutes to go. The Saints had a number of chances to make it a one possession game late, but never got over the hump, eventually succumbing 90-81 to lose for the fifth time in their last six contests. Again, the Saints had trouble slowing down the Busters offense as Garden shot 52% in the half to finish the game at 51% overall. Seward shot 48% in the second half to finish the game at 49% from the field. Seward used 42 free throw attempts on the afternoon to outscore the Busters by 13 at the line. Sims led all scorers with 27 points in the loss while getting to the free throw line 20 times for Seward. Malik Brown set a career high in scoring for the second straight game with 17 while Micah Littlejohn reached double figures for the second straight night with 13. Seward’s miserable first half of Jayhawk Conference play ends at 3-10 while they fall to 6-11 overall with the loss. Garden City remains in the thick of things with the victory, improving to 12-5 overall and 8-5 in conference action. The Saints road won’t get any easier as they hit the road to Hutchinson in their next outing, taking on the #2 and undefeated Dragons in a 7:30 tip Wednesday in the Sports Arena.